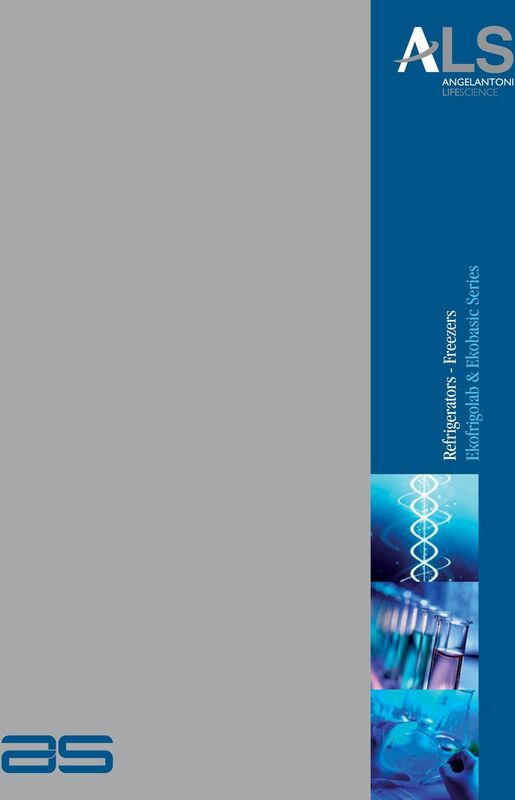 Download "Refrigerators - Freezers. 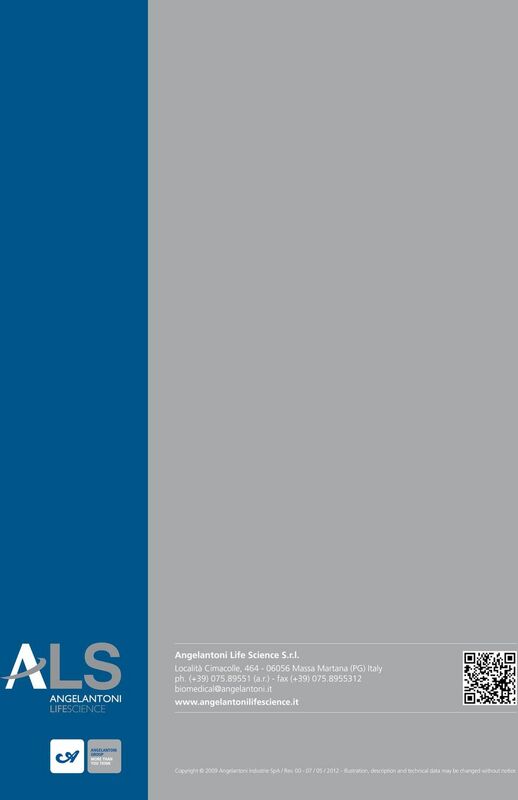 Ekofrigolab & Ekobasic Series"
2 Angelantoni Life Science S.r.l. 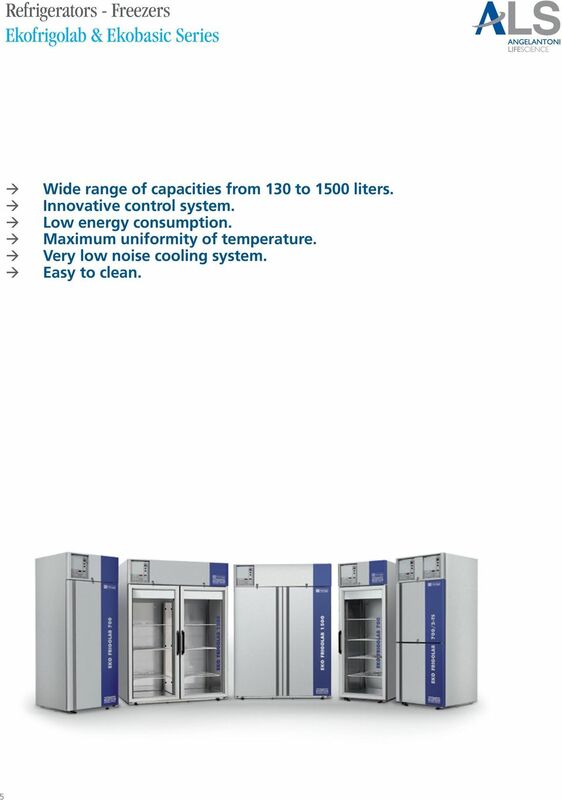 manufactures a wide range of refrigerated cabinets and combined refrigerator/freezer cabinets. 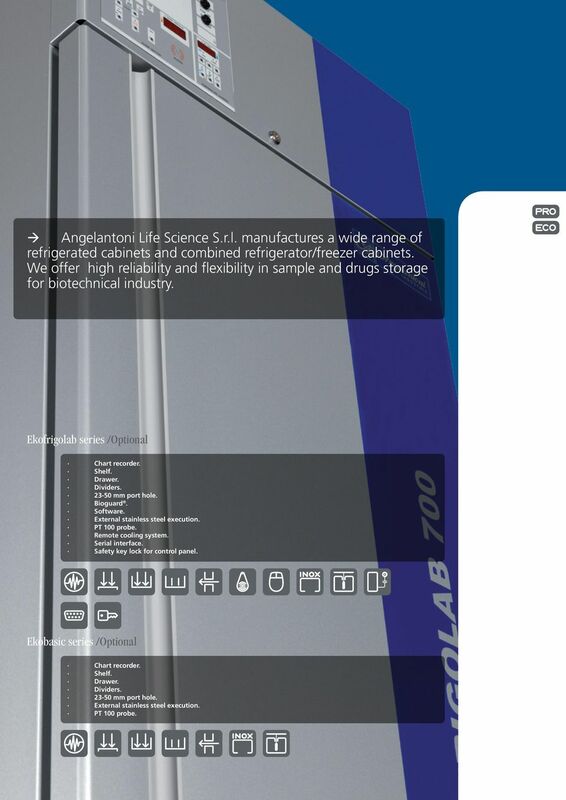 We offer high reliability and flexibility in sample and drugs storage for biotechnical industry. Ekofrigolab series /Optional Chart recorder. Shelf. Drawer. Dividers mm port hole. Bioguard. Software. External stainless steel execution. PT 100 probe. Remote cooling system. Serial interface. Safety key lock for control panel. 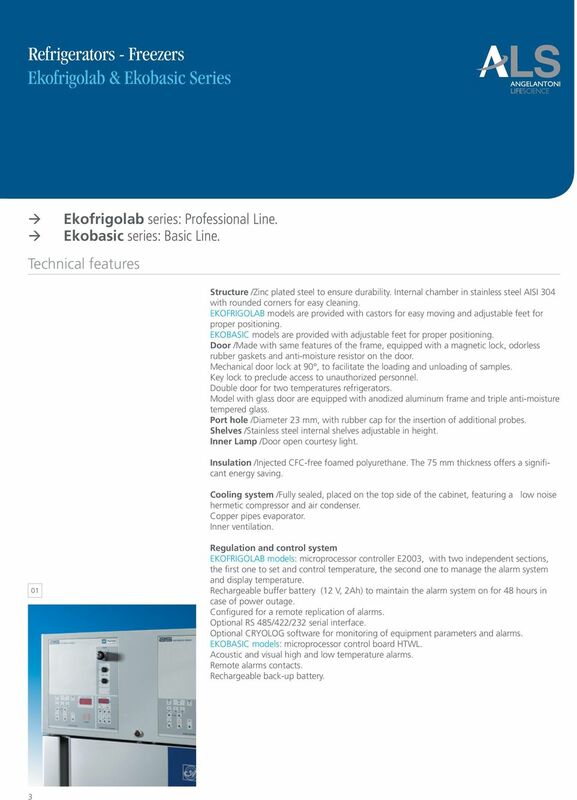 Ekobasic series /Optional Chart recorder. Shelf. Drawer. Dividers mm port hole. External stainless steel execution. PT 100 probe. 6 Copyright 2009 Angelantoni Industrie SpA / Rev / 05 / Illustration, description and technical data may be changed without notice. NEW! Thermo Scientific Revco PLUS -86 C Freezers Protecting Your Precious Samples Part of Thermo Fisher Scientific Your life s work. What is it worth to you? Your life s work. What is it worth to you? PIZZA RANGE Confirming its standing as a cooking specialist, ANGELO PO offers conventional ovens for cooking pizzas. The range of products has varying chamber sizes to meet the most demanding requirements. S IJDERS SCIE TIFIC B.V.
AUTOCLAVE VAPOR MATIC WITH OFFICIAL PHARMACOPOEIA CYCLE MOD. 770/A WITHOUT PRINTER COD MOD. 770/B WITH ELECTRONIC PRINTER COD. Silicone oil is as the medium and the drying effect is uniform. The Temperature error is less than or equal 1. In order to maintain temperature inside the refrigerator in summer, keep the thermostat at position 5-6. Forced Convection. Laboratory Ovens. 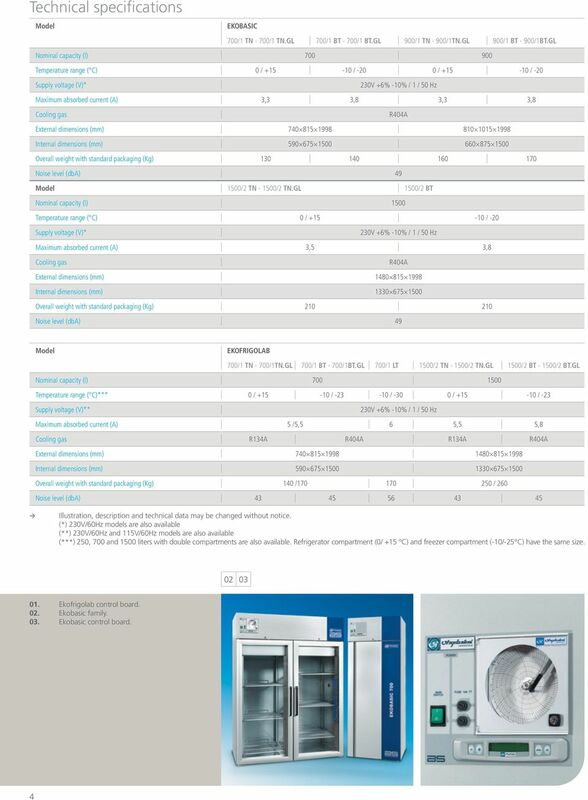 Isotherm Forced Convection Laboratory Ovens, 110L, 54L and 32L models. REFRIGERATION Freestanding 36 W. French-Door Bottom-Mount. Standard Features & Accessories. Model Options. Models include.